Now that Fall is in full swing, I’m enjoying several seasonal vegetables. One of them is brussels sprouts. 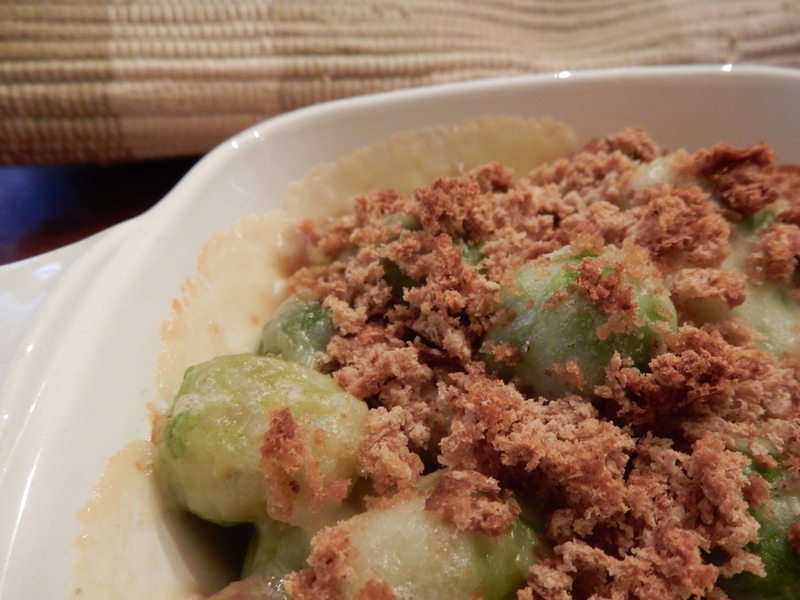 Brussels Sprouts Au Gratin is an old-time way to serve them. The delicate essence of the cheese in the sauce nicely balances the slightly bitter taste of the brussels sprouts. Preheat oven to 350° F. Wash the brussels sprouts and remove any wilted leaves; then put in a saucepan and cover with water. Bring to a boil using high heat, then reduce heat to medium and simmer until the brussels sprouts are tender (about 5 minutes). Drain well. Meanwhile, in another pan, using medium heat, melt butter; then stir in the flour. Gradually, add the milk while stirring constantly; add the cheese. Continue stirring until cheese sauce thickens. Add the brussels sprouts to the cheese sauce. Stir gently to combine. Put into a casserole dish, and sprinkle the bread crumbs on top of the mixture. Bake until hot and bubbly (about 15 minutes). *Note: To make the bread crumbs, I took a bread crust, folded it into quarters, and then used a grater to grate the crumbs. An aside—I struggled when I wrote this post because I couldn’t decide whether to capitalize brussels. I googled it, and found that there was no consensus. I ended up using a lower case b –but don’t really like how it looks. What do you think? Should the b in brussels be capitalized? Posted on October 26, 2015 October 25, 2015 by SherylPosted in FoodTagged brussels sprouts, recipe, vegetables. You know: I have never eaten Brussel (brussel) sprouts! I was with my niece last week when she bought some, and I asked her if they taste like anything else. She said “little cabbages”! I love cabbage, so I really should try them. I think the word has a bad connotation, sort of like broccoli (which I also like). This looks like a yummy dish! You should give them a try. If you like cabbage and brocoli, I think you’ll like brussels spouts. All three are members of the cole family of plants. I have no idea if one should capitalize or not, but I do love brussels sprouts . I like your breadcrumb technique. I’m glad you like my tip for making breadcrumbs. I’ve found over the years that a grater works really well for making fine bread crumbs. What would you do if it was asparagus? Caps no caps, your choice. Love the recipe, by the way. I definitely won’t capitalize asparagus. The fact that it’s both a place name and a food name is what has me confused. I like your suggestion that I just pick one and go with it. I also love brussels sprouts. Your recipe looks very good! It’s a wonderful, easy-to-make recipe. Looking forward to trying this. When I googled one of our local grocery stores, they capitalized the B in Brussels. Either way looks correct to me. This is another recipe I’ll copy: but for the cheese sauce. As far as I’m concerned, Brussels sprouts deserve to be composted from the moment they’re harvested, but that’s just me. I was curious about the capitalization issue. I always have, but I went looking, and found this interesting Q & A from a University of Chicago grammar site. I’m adding it only because it’s so hard to find on the page, tucked into a hundred questions. Question: Is brunswick capitalized when used to modify stew? Virginians, of course, would vociferously vote for the capital, claiming that full enjoyment of Brunswick stew depends on understanding its origin in Brunswick County, Virginia. But you are from North Carolina. Interstate rivalry might prompt you to lowercase, protesting that Brunswick County, Virginia, has nothing to do with your stew–and perhaps even disparaging the tenderness of Virginia squirrel meat. I have already overruled the dictionary in recommending that Brussels sprouts be capitalized (in a quixotic attempt to keep them off my dinner plate). Today, I find myself forced to recommend capitalizing Brunswick stew in Virginia and lowercasing brunswick stew in North Carolina (in the name of interstate rivalry). This looks and sounds so yummy! I take it that you made it (going by the photo). Did you like it? I always capitalize the “B” in Brussels sprouts. But there was a time when the “F” in French fries was consistently capitalized. I wonder if that’s the case anymore? Thank you for your lovely recipes. Yes, I liked it. It looked lovely and tasted wonderful. The creaminess of the cheese sauce enhanced the flavor of the brussels spouts, and it was a wonderful way to serve this vegetable. I would say capitalize. I have a Belgian (Flemish) aunt by marriage …she would capitalize it. She adds a bit of nutmeg to the sprouts. We have areas around here settled by Belgians in the 1800’s. It helpful to know that a Belgian would capitalize the B in Brussels spouts. The nutmeg sounds good. Would she just boil them in water, and then sprinkle a little nutmeg on after they were drained? Hi, I replied yesterday , but seems to have not made it through?? She simmered them in water, then drained, then stirred in butter and the nutmeg. As far as salt or pepper, I don’t remember. I’m sure they were probably cooked in salted water as that was the norm. This sounds delicious. I’ll have to give it a try. Looks very tasty! I suggest to place the Brussels Sprouts in ice water after cooking. This will keep them even greener. Thanks for the tip. This is a new one for me. I’ll have to try putting them in ice water. Any green vegetable benefits from this procedure- green beans, broccoli and Brussels Sprouts in particular. I also recommend salting the cooking water a bit . I generally add a little salt to the water when cooking bland vegetables (beans, potatoes), but skip it when cooking vegetables with a stronger taste such as brussels sprouts. Due to the ongoing discussion in the media about the possible health effects of eating too much salt, I tend to try to avoid adding salt whenever possible; but in the bigger picture of things, adding little salt to the cooking water probably adds very little salt to our total daily consumption. I agree with lowering overall salt consumption, but in this case, a little goes a long way. It makes green vegetables tastier, greener and firmer. That makes sense. Thanks for the additional info. I knew that vegetables are tastier with salt, I never thought about how it also affects the color and texture. I love brussels sprouts, but hubby doesn’t. He’s on a campaign against them. Sometimes I’ll throw a couple into vegetables I’m steaming to complement a meal. As soon as he sees them in the frig he starts informing me that he doesn’t like them and keeps it up until I’ve consumed them. He knows that I know not to feed them to him, but he behaves as if I’ve insulted him by including them in the pan. Interesting how different people like (and dislike) different vegetables. I will have to try this. Lately we have been ‘ga-ga’ for Brussels sprouts (1 lb) cut in 1/2 (or quarters if really big) tossed in 3 Tbsp canola oil and then turned out cut-side down in a single layer on a hot grill pan. Sprinkle w/ a dash of salt after 5 min., and 2 minutes later stir the sprouts around and pour over them a mixture of 1 tbsp each of soy sauce, honey, boiled water, and crushed garlic, and a dash of crushed red pepper. A few minutes later, they are ready. Sprinkle with mint and serve. This, thus far, is the only way hubby likes them. (In fact, he is ravenous for them this way, and he always used to hate Brussels sprouts.) But I shall try your recipe to see what he thinks! Your recipe sounds really good. I’ll have to give it a try. I don’t think i tried brussels sprouts until the last 5 years! But I kind of like them and think I should try your recipe because I REALLY like cheese! I think you’d like this recipe. The cheese nicely complements the brussels sprouts.